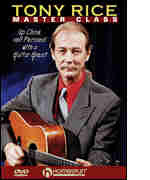 The highly revered guitarist Tony Rice continues the breakdowns and analysis of his world-class style and technique. His lesson includes folk and country instrumentals, fiddle tunes and his innovative arrangements to well-known standards. For intermediate level guitarists. 1 hour, 50 minutes.